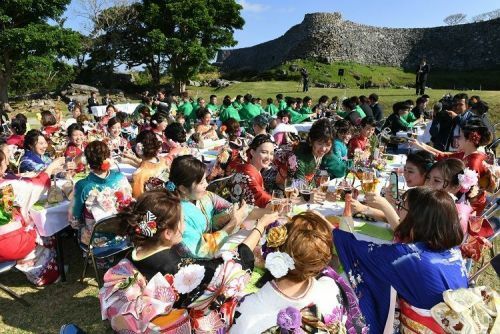 Young adults toast in front of the Nakijin Castle Ruins, a world heritage site located in Nakijin Village, on January 4. Photographed by John Matsumoto. NAKIJIN—Coming-of-age Day is a national holiday celebrated annually on the second Monday of January. Since ringing in the new year, municipalities all over Okinawa have hosted coming-of-age ceremonies for those who recently turned, or will be turning 20 years old. The village of Nakijin held its coming-of-age ceremony at the Nakijin Castle Ruins, a UNESCO world heritage site, on Jan. 4. It is the first time the site has hosted such a ceremony. In total, 87 newly minted adults joined to celebrate the beginning of a new chapter in life. Hosting the ceremony at Nakijin Castle Ruins was made possible by an executive committee formed by members who are coming of age this year. “I wanted to take advantage of the world heritage site and share this moment with everyone,” said Koshiro Shinjo, 20, a committee member and first year student at Nara University. Participants dressed up in suits and formal kimonos—the hakama and furisode, as they reunited with friends and snapped photos of each other. Shinjo delivered a speech on behalf of his peers at the ceremony. “I hope to be an adult that can make his own decisions in overcoming various challenges with imagination. I ask for your guidance and emboldening,” he said.